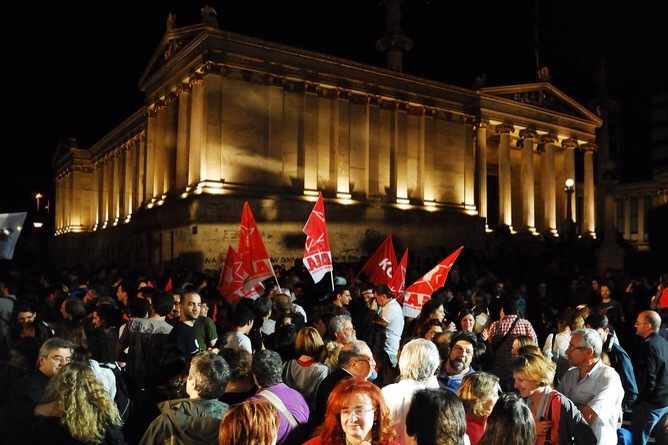 Here’s what you should know about Syriza and the Greek election. Explainer: why the Greek election is so important ? This Greek election is the most important in recent memory. It appears Syriza has won win by a large margin, ending four decades of two-party rule in Greece. Since 2010 – and as a result of austerity measures – the country has seen its GDP shrink by nearly a quarter, its unemployment reach a third of the labour force and nearly half of its population fall below the poverty line. With the slogan “hope is coming” Syriza, a party that prior to 2012 polled around 4.5% of the vote, seems to have achieved the impossible: creating a broad coalition that, at least rhetorically, rejects the TINA argument (There Is No Alternative) that previous Greek administrations have accepted. In its place, Syriza advocates a post-austerity vision, both for Greece and Europe, with re-structuring of sovereign debt at its centre. How significant is this victory for Europe and the rest of the world? Comments range from grave concerns about the impact on the euro and the global economy to jubilant support for the renewal of the European left. For sure, Syriza is at the centre of political attention in Europe. The origins of the party are to be found in a series of splits and consolidations involving various left-wing political groupings that, in one form or another, were originally related to the Communist Party of Greece. Syriza in its current form is a strategic coalition comprising a variety of political platforms that include social democrats, radical socialists and communists, environmentalists, anti-globalisation campaigners and human rights advocates. Its original base comprised small business owners, academics and teachers with very little appeal among traditional working class voters. But the party’s current appeal is far broader, extending to the middle classes that were hit so hard by austerity measures (especially those associated with the public sector), as well as self-employed people, ex-small business owners, unemployed and underemployed people (especially youth). Unlike other EU countries, these parts of the Greek electorate are not attracted to ultra-nationalist Eurosceptic parties. As traditional left-of centre voters they find attractive Syriza’s political narrative, a combination of anti-establishment discourse, mild left-wing patriotism, a vision that another Europe is possible and a vague hope for improving their economic and social condition. Will Greece leave the euro? How likely is that Alexis Tsipras, Syriza’s charismatic 41-year-old leader, will be “the Communist Harry Potter who could implode the eurozone”? It is clear that the majority of Syriza representatives want to avoid having to take Greece out of the common currency. Despite some eurosceptic voices in the party, the leadership can hardly be characterised as anti-European. In internal discussions, various factions within Syriza have argued for introducing a national currency but these have remained, so far, a minority voice within the party. Instead, the current leadership of Syriza has made numerous statements that it does not intend to destroy the euro or force Greece out of the eurozone. But they also mentioned that they are not willing to keep Greece into the eurozone at any cost. If Greece leaves the euro under Syriza, it will happen not because its leadership wants to but because it will be forced to. What does it mean for Europe? In terms of political rhetoric, Syriza has stated its political ambition is to change Europe as well as Greece. In what is admittedly a clever political move Syriza refused to accept the narrative of Greek exceptionalism when it comes to sovereign debt. While attacking the incompetence and corruption of the two-party establishment that has run Greece since the 1970s, Syriza has framed the issue of Greek sovereign debt as part of the wider issue of European economic governance and, most recently, promoted the idea of a European summit on debt. In this way it opened a political space both for itself and other European political forces to change the dominant economic narrative in the EU. Is the EU establishment going to respond? The announcement of new quantitative easing measures from the ECB marks a change in economic policy but according to chief Mario Draghi, Greece could be treated differently and any help will come with conditions. The months ahead will be tense and uncertain but one thing is for sure: nothing will be the same in Greek and European politics after Monday. This entry was posted on Tuesday, January 27th, 2015 at 09:12	and tagged with change, communism, democracy, dhragma, diplomacy, elections, EU, Euro, eurozone, future, Greece, leave, merkel, Parliament, past, power, prime minister, syriza and posted in Global news, International Relations. You can follow any responses to this entry through the RSS 2.0 feed.